Commercial and industrial roofing covers a significantly larger area compared to residential roofing. For this reason, the requirements of the two are different. Availability: How readily available and abundant is the roofing material? Ease of installation: Is installation easy and can be it done by any roofing contractor? Or do you need to find some who specializes in the particular roofing product? Turnaround time: How long does it take to get the roofing done? Some roofing materials may take longer than others. Weatherproofing: How does the roofing material hold under various weather conditions? Depending on the location of the commercial or industrial building, does the material hold well under Australian summers with heavy rains and hailstones, or resist corrosion in the coastal regions? Durability: How durable is the material and what is the average lifetime of the roofing product? This may matter from an investment standpoint – more durable materials cost more. Customizability: How flexible is the roofing material? Can it be customized and shaped to the specific structure of a roof? With these questions in view, let’s take a look at some of the most popular roofing products available for commercial and industrial buildings in Australia. Metal roofing has conventionally been the popular material of choice for industrial and commercial buildings. Metal roofing is fairly affordable, it offers plenty of options, and businesses can choose a variety that best meets the local climate needs as well as any specific requirements. That being said, various metals are used in creating metal roofs. And each metal has its own distinct features. The following metals are available for industrial and commercial roofing. Zinc roofing has traditionally been used for more than a 100 years. More recently, Australian businesses and commercial building have taken a liking to zinc roofing and cladding. This is particularly so because zinc offers excellent flexibility and can be easily shaped to suit any roof size, type and shape. Because zinc is soft, it also takes considerably less energy and time to melt and mould it to a desired shape. For large-scale roofing projects, this essentially translates into lower costs. Zinc also offers excellent durability. In fact, a well-installed zinc roofing is expected to last well beyond a 100 years. Unlike many other metals, zinc can also be tweaked to mitigate impact noises. A slight downside to zinc for businesses is that it costs more than many other metal roofing options. However, the steep installation costs are offset by the exceptionally long life of these roofs. For businesses seeking to make environment-friendly roofing decisions, zinc stands out as a great option. Zinc is easily available and 100% recyclable. This means that at the end of its very long life-cycle, which is usually above 100 years, a zinc roofing can be taken down and fully reused. Aluminium is more commonly used in homes but it is an equally great choice of roofing material for industrial and commercial units across Australia. A stand-out feature of aluminium is its excellent resistance to salt spray corrosion. This makes it a great choice for buildings in the coastal regions. Aluminium is typically lightweight and very durable. This makes it easier to install, reducing the installation costs. Its thin and lightweight profile also has a downside – it can easily sustain damage in strong winds and hailstorms. Although aluminium roofing is also available in thicker panels, they cost substantially more. 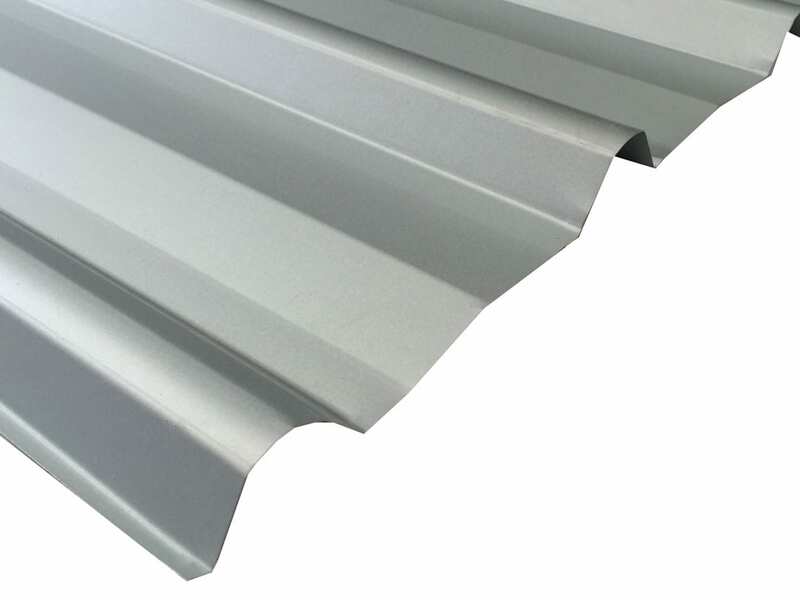 Aluminium roofing typically involves the use of ribbed sheets. Both painted and unpainted aluminium sheets are available for roofing. In general, aluminium costs more than steel. Other metals with aluminium coating offer similar properties and are often preferred over aluminium-only roofing. Copper is another metal that has long been used for roofing. Copper offers an exceptional durability and will last 200 years and more in a suitable environment. A stand-out feature of copper roofing is its aesthetic appeal. Copper roofing looks stunning and adds a brilliant finish to virtually any commercial facility. It also ages very well, like an old wine. Over time copper incurs layers of a distinct green patina which only add to its classiness. Apart from its outlook, copper has excellent weather-resistant properties. It’s a relatively softer metal, yet incredibly durable. So while copper may dent under a hailstorm, it will not sustain any serious or permanent damage. Copper is also fire-resistant and waterproof. A significant disadvantage of copper roofing is that it expands and contracts with fluctuations in the temperature. This isn’t a problem is the roof is installed by an experienced contractor who accounts for these changes during the installation process. Steel is one of the most affordable metal roofing options. Different varieties of steel are typically used in commercial and industrial roofing. Most notable among these is colorbond steel. Colorbond steel comes in a huge range of colours and profiles. It is very strong and durable, and is corrosion-resistant thanks to the top layer of coating on the steel body. Thanks to its exceptional strength, steel can easily withstand severe weather conditions while incurring little to no damage. Colorbond steel roofing offers a quick turnaround and excellent flexibility. It can be installed quickly, at a significant less cost than zinc or aluminium roofing, and shaped to suit virtually any roof type and size. Businesses can choose from more than 20 colours when it comes to colorbond steel. Such customizability allows industrial and commercial buildings to feature any desired roof outlook, matching it perfectly with the other elements of architecture. Galvanized steel is another variety of steel that is commonly used in industrial and commercial roofing. Compared to plain steel, galvanized steel comes with an extra coating of zinc. Zinc forms zinc oxide on the surface and prevents the corrosion of the layers of steel within. 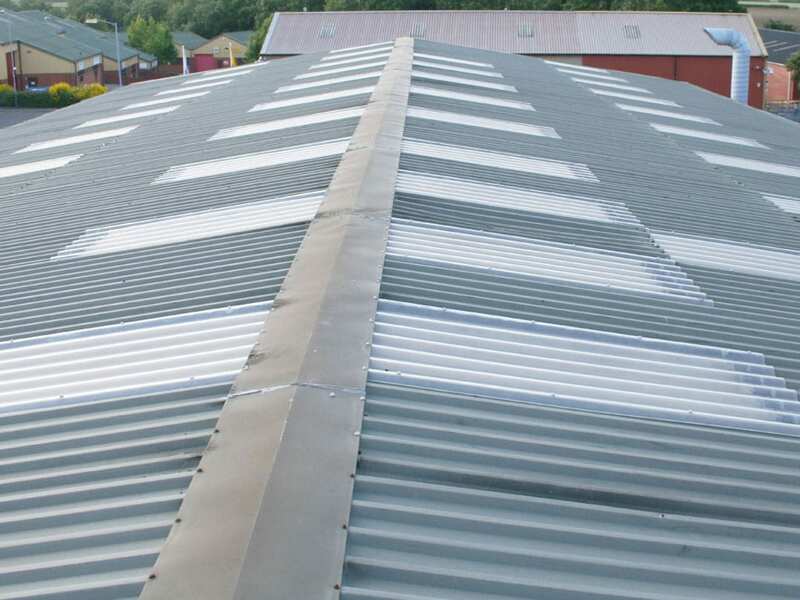 Galvanized steel roofing is frequently seen on industrial and agricultural buildings. It is frequently preferred for its affordability and good resistance to rust. When installed properly, galvanized steel roofing can last upwards of 50 years which is more than sufficient for most industrial and commercial facilities. That being said, galvanized steel roofing features a typical look. Although it looks fine on a remote industrial facility, galvanized steel is not the most attractive roofing option for a frequented commercial building. For such buildings, colorbond steel is the way to go. EPDM is a kind of synthetic rubber. It stands for ethylene propylene diene monomer. EPDM is an excellent insulator and ideally suited for industrial and commercial roofs with low slope or flat profiles. EPDM is waterproof and offers good long-term durability. It can withstand weather conditions such as rains, high winds and hailstorms quite effectively. For industrial and commercial buildings, the insulation properties of EPDM translate into reduced heating and cooling needs year round. Another notable advantage of EPDM roofing is that it very affordable compared to most other roofing materials. With an expected life of around 20 years and more, EPDM is a very sound investment for Australian businesses seeking a cost-friendly yet effective roofing solution. A slight downside to EPDM is that it doesn’t look as neat or classy as many other roofing materials. This can be offset by choosing EPDM shingles for low-slope roofs, giving them a slate-like outlook. Tile roofing utilizes different types of tiles to achieve an excellent aesthetic finish. Tiles typically used in a tile roof include concrete tiles, clay or terracotta tiles, ceramic tiles, stainless steel tiles and tiles made from other synthetic materials. The most notable advantage of tile roofing is the look it brings to any residential or commercial building. Commercial buildings seeking to enhance their outlook often prefer tile roofing to other options. Tiles used in such roofing are available in a variety of shapes and sizes. This makes it easier to achieve a perfectly customized roofing by using these tiles. Concrete and clay tiles offer excellent durability. Roofs made from these tiles are expected to last upwards of 100 years. Concrete tiles may lose their original colour soon but clay tiles keep their vibrant colours for a very long time. Ceramic tiles have good reflective properties. When painted white, they can ward off the heat in the summers and retain the indoor warmth during the summers. 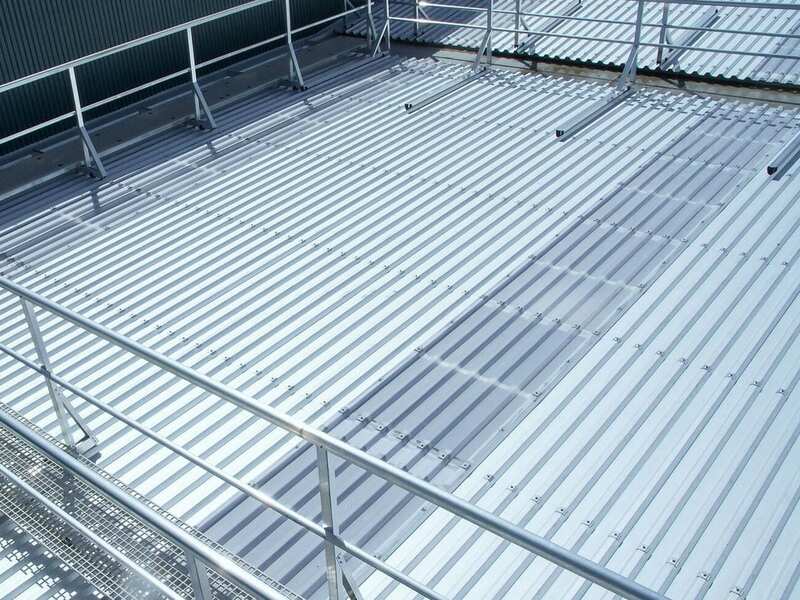 Stainless steel tiles are also a viable roofing option for certain industrial units, combining both a sturdy performance and a great outlook. A major downside to tile roofing is its costs. Tile roofing costs more than most other roofing materials, such as metals or fibreglass. Solar roofing is an increasingly popular choice of roofing material for commercial and industrial buildings in Australia. Solar roofing uses large panels or tiles to cover a rooftop. The panels or tiles use integrated solar cells to generate solar electricity while bringing a modern and sleek finish to a roof. Solar roofing typically utilizes incredibly durable composite materials. Such materials are very resilient and able to withstand severe weather conditions, including Class 4 hailstones, quite effectively. Solar roofing installations are also fire-resistant and water-proof. 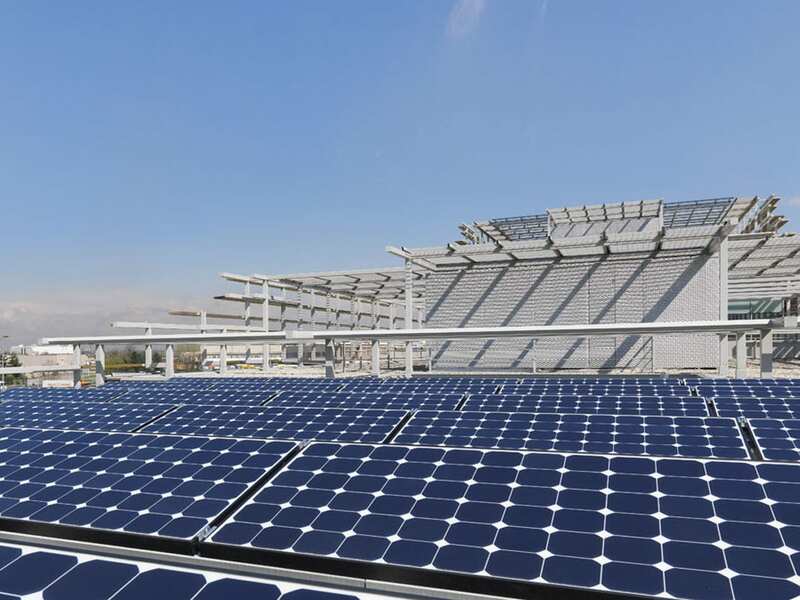 For businesses, the obvious benefit of solar roofing is energy generation. Solar roofing lasts a long time, often offered with a lifetime warranty. A solar roof can generate a significant amount of electricity to power up the industrial or commercial needs of a building. In this way, solar roofing can cut down the electricity costs of a building. Solar roofs are available in a multitude of panel or tile sizes, colours, shapes and other options. Any building can achieve a modern or classic look using solar roofing. Solar roofing can also be selectively used together with other traditional materials. One of the best roofing materials for industrial and commercial buildings in Australia is fibreglass. Fibreglass roofing panels come in a wide range of shapes, sizes and types. Some of the varieties are custom-manufactured to meet the specifics of the Australian weather and climate conditions. Weather-Proof: Fibreglass roofing panels can be customized to incorporate specific properties. An additional layer on their exposed side makes these panels resistant to ultra-violet rays. Fibreglass panels can also withstand rains quite effectively. Thicker panels are able to withstand heavy hailstones without breaking or puncturing. Depending on the specific weather conditions of your area, you can choose a variety of fibreglass that caters to these conditions. Fire-Resistant: Fibreglass roofing panels are available with fire-retardant properties. This makes them a particularly great choice for industrial and commercial buildings located in bushfire-prone areas. Fire-retardant fibreglass does not catch fire – instead, it prevents the fire from spreading by acting as a temporary block. Customizability: Fibreglass roofing panels are available in a huge range of shapes and sizes. They can be customized to match virtually any metal sheet profile. Manufacturers will also customize the fibreglass panels to meet any other specifications of industrial and commercial facilities. This makes it easier for businesses to achieve a customized roofing solution using these panels. Skylight Properties: Many industrial fibreglass roofing panels also incorporate industry-grade skylights. Natural sunlight filters through the skylights and illuminates the interior of a warehouse, factory, retail store, office building or virtually any other building. By offering natural lighting of the interior spaces, skylight fibreglass panels reduce the energy consumption of a building and help it become more environment-friendly. Australia is known for receiving ample natural sunlight year-round, so skylight fibreglass panels are a great choice for all kinds of buildings. Zero Maintenance: Fibreglass roofing requires little to no maintenance at all. They also undergo very little wear-and-tear throughout their lifecycle. This makes them incredibly convenient for larger buildings where maintenance of conventional roofing systems can be a costly affair. Corrosion-Resistant: Many industrial environments involve the production of corrosive and toxic fumes. Such fumes can quickly damage conventional roof materials and degenerate them. In contrast, fibreglass panels are offered with corrosion-resistant properties. This makes them a perfect choice for fume-intensive industrial environments. Whether it’s a processing plant, a power generation unit or a chemical factory, fibreglass units are able to easily withstand the industrial byproducts. Highly Affordable: Fibreglass roofing panels are a modern roofing solution. They are incredibly affordable compared to other roofing materials such as colorbond steel, copper, or tiles. This makes them a preferred roofing choice and an easy investment for most businesses. All the benefits of fibreglass roofing panels notwithstanding, such a roofing has a significantly shorter lifecycle. Most fibreglass panels come with a warranty of anywhere between 10 years and 30 years. While this is more than enough for most industrial and commercial units, it does pale in comparison to the durability offered by metals such as zinc and copper, and terracotta or concrete tiles. It’s also worth mentioning that the sheer flexibility and customizability of the fibreglass roofing panels is almost unmatched. This is precisely why businesses around Australia increasingly prefer this roofing system. By offering the option of weatherproofing, corrosion resistance, fire resistance as well as other properties, fibreglass panels can be tweaked and customized for virtually any industrial or commercial application. Zincalume is a kind of metal roofing that is often categorized separately. This is because zincalume is a combination of zinc, aluminium and steel. Steel is the main component in zincalume whereas zinc and aluminium are used to protect steel from corrosion and enhance its properties. Zincalume is a popular roofing material used across Australia. It owes its popularity to the fact that it is particularly well suited to the Australian climate. Being a specific variety of steel roofing, zincalume roofing is equally suitable and cost-effective for industrial and commercial buildings. More recent varieties of zincalume come with activated steel. This adds a protective coating of aluminium on top of steel and offers anti-scratch properties. Zincalume offers excellent durability and can withstand weather conditions without incurring any damage. Compared to many other metal roofing options, zincalume is also better at sustaining impact without bending or puncturing. This makes it a great choice in hailstone-prone areas. Unlike standard steel roofing or other metal roofing options, zincalume serves in good stead in the Australian coastal regions as well. It can withstand salt sprays without corroding, making it suitable for the commercial or industrial facilities along the coastal areas. Affordability is another attractive aspect of zincalume. It costs less than other standard steel roofing options. So if you are a business on a budget, a zincalume roofing solution may be a more viable option than any other metal roofing. A slight downside to zincalume roofing is its looks. Zincalume panels come in an aluminium finish with no extra coating. The standard aluminium colour may fade over time. The finish may also not blend in very well with other elements of a building. Composite shingles are made from organic asphalt or fibreglass material. They are rectangular shaped, like tiles, and offer a classic look and finish to any rooftop. Commercial buildings can choose shingle roofing to achieve an aesthetic finish that also offers many practical benefits. For a start, composite shingles are coated to be completely water-resistant. So they can effectively prevent any leaks during heavy rains. Shingles are also fire-resistant which makes them a good choice for industrial and commercial buildings in the bushfire-prone regions. Composite shingles embody all the useful features of the standard tiles and then some. Compared to standard tiles or slate shingles, composite shingles weigh considerably less. For this reason, it is easier to transport and install them, resulting in lower installation costs. Composite shingles are also more affordable to replace. Another advantage of composite shingles is their customizability. Like fibreglass panels, composite shingles can be coated with UV-resistant materials. This adds to the weather-resistant properties of the shingles. On average, composite roofing can last between 30 and 50 years. Considering the lower costs of such roofing, the aesthetic appeal and easy repair or maintenance, composite shingles are a good option for commercial roofing.